Greenlight Pinellas Plan does NOT include Rail link to Tampa! 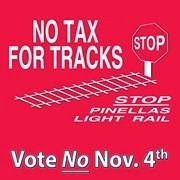 No Tax for Tracks is offering this clarification because The Tribune and Channel 8 News have broadcast reports stating the Greenlight Pinellas Plan includes a rail link to Tampa over the Howard Franklin Bridge. Our research has discovered that as late as November 2013, there was confusion within PSTA over whether the Greenlight Pinellas Plan funded a rail line to Tampa. 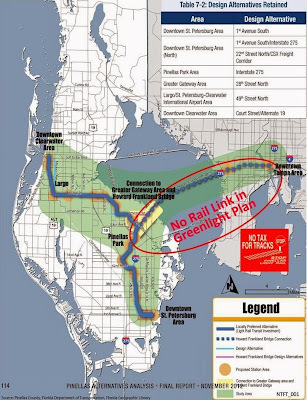 But the Greenlight Plan does not include any rail, or rail links to Tampa. At PSTA’s Planning Committee Meeting on November 13, 2013, PSTA’s CEO, Mr. Brad Miller, said there is no funding in the Greenlight plan for any rail link to Tampa. Listen to him explain what kind of funding projects the Greenlight Pinellas Plan contains by clicking on video. What I find interesting is the amount of time the County Commission spent talking about trains, bonds and financing for light rail during the final approval vote meeting. After all the talking they just took the PSTA bait hook line and sinker. This is a light rail deal. No doubt about it. All of the talk about expanded bus service is just icing on the PSTA cake, something to make the whole deal easier for the public to swallow. And there are no mandates in the Ordinance requiring PSTA to actually follow through on the bus commitments. In their zeal to get this to pass on November 4, PSTA and their supporters are going to pull out all the stops. Take all of that stuff that will be showing up in your mail box and on your TV screen with a grain of salt as pointed out in the press release. Let's all hope the political fact checkers do their job.